How Long Does It Really Take to Close on a House? 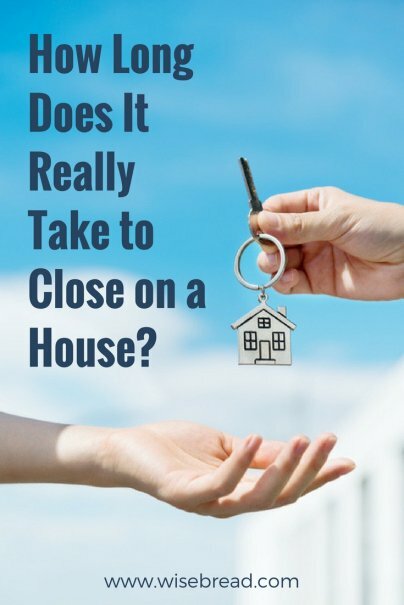 Home » Personal Finance » Real Estate and Housing » How Long Does It Really Take to Close on a House? Buying a new home is an exciting process, but there are also a lot of challenges and frustrations that came along with closing on a mortgage. Even when you and seller can agree on a closing date, this date is not set in stone and can change for many reasons. There are several things that can delay the closing of a new home purchase. While most can be resolved quickly, here are the more common causes to be aware of. Your credit report is checked a couple of times during the home buying process. If your report shows new debts, mistakes, a sudden drop in your credit score, or even a recently reported late payment, you might have to fix things in the underwriting stage of the loan before you can close. If you need to finance your home, the lender will request an appraisal of the property. If the appraisal comes back lower than the seller's asking price, the lender will refuse your loan. In order to remedy this, you will need to renegotiate terms with the seller or pay the difference with cash before the loan can go through. Once your home buying process begins moving forward, your finances and financial history will be looked over closely. This can result in the need for several documents and letters of explanation for certain aspects of your finances. For example, if your bank account has your maiden name on it, you'll need to explain the discrepancy. An issue with the title, such as a lien, will delay the home sale. Sometimes a closing delay has nothing to do with the buyer or seller, but instead with the professionals who are handling your loan. You'll work with many different people throughout the homebuying process, so if any one of them delays turning in their portion of the documents for the next step, that delay will be felt by you and the seller. The delays can come from your own real estate agent or the buyer's, as well as the lender, the bank, and even the underwriter. There is always the possibility of something going amiss during the final walk-through. The home you looked at and had inspected could suddenly have plumbing or electrical issues the day of the final walk-through. Any issues will need to be resolved before the home closes. You can't control everything in the closing process as the buyer, but you can manage your responsibilities in a way that speeds up the process. Here are a few things that you as the buyer can do for a quicker home closing. Even though you are excited to purchase a home, don't celebrate by spending a lot of money or opening a new line of credit. Wait until your mortgage clears before you buy furniture or a new car. During the home buying process, you will be asked to answer a lot of questions, provide a lot of documents, and attend several meetings. Being readily available and getting documents to the agent and lender quickly will speed up the process. Schedule the home inspection as soon as possible to ensure there is enough time for quick repairs. A delayed home closing can be frustrating, but many of the possible delays that happen are actually to protect the buyer. Buying a house is a large investment, so it is crucial that all of the paperwork is done correctly so that you don't endure problems later.